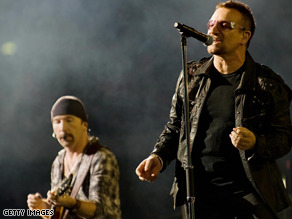 U2 performed outside Washington, DC Tuesday night. WASHINGTON (CNN) - Politics and rock collided in suburban Washington, D.C. on Tuesday night when Irish rockers U2 came to town for their U2 360º tour. In this city full of government and political operatives, there was no shortage of references to both during the two-hour performance. Bono introduced what he called "the nation state of U2," designating each band member with a cabinet or government position. He called drummer Larry Mullen, Jr. "the author of our constitution" - a reference to the fact that it was Mullen's ad on a high school bulletin board that led to the formation of U2 in the late 1970s. He also bestowed on him the title of leader of the opposition. Bassist Adam Clayton shares the double duty of minister of culture and foreign minister. Most would probably assume Bono as the head of state in this government, but he told the audience he was happy with being "majority leader" and "Madame Speaker" because of his interest and ability in making deals and building consensus. President The Edge gets that honor, who Bono dubbed, "the leader of my free world." During the show, Bono also acknowledged the recent passing of two members of the Kennedy family, dedicating "Beautiful Day" to Eunice Kennedy Shriver and "New Year's Day" to Sen. Edward M. Kennedy. U2's classic protest anthem "Sunday Bloody Sunday" was dedicated to the protesters in Iran, with green lights and video imagery - the color of the Iranian opposition during last summer's disputed presidential elections – making very clear where the band's sympathies lie. During a pause in the show, Bono acknowledged his work in third world debt relief, poverty, and AIDS with political operatives from the left and the right. He also gave shoutouts to several Washington VIPs who were in attendance, including Cardinal Theodore McCarrick, the former archbishop of Washington; Speaker of the House Nancy Pelosi; former White House chief of staff Josh Bolten; Sen. Patrick Leahy, D-Vermont, and former Sens. Tom Daschle and Bill Frist. At the end of "One" he also acknowledged former President George W. Bush for his efforts to provide more AIDS medicines for Africa during his time in office. Bono is a fool if he thinks he can play footsie with these idiots.Hes being used like a dish rag. Nut jobs are plentiful in Washington, elected and/or otherwise..
U2? Meh. Sorry, they just don't do anything for me. They're one of those bands you're supposed to like, but secretly don't, like the White Stripes or something. Ween could kick their Guiness drinking butts any day. Have a nice day! One of my favorite groups....a mission with music (who would know that this is the portal to heaven)....Well done good and faithful servants!! ps...would love to see the truibute in green for those in Iran voicing out..come on PBS ..grab this show. Who cares? Entertainers need to stick to entertaining and stay out of politics. Good entertainers keep their mouths shut about politics. Now we know what we needed to know. This is news on CNN? Rock concert reviews? Really? This is ticker "worthy"? Wow! These foreigners finally thank President Bush after bashing him around the world. They should just stay out of U.S. politics. Are they U.S. citizens? No more U2 for me! While the rockstar that is SUPPOSED to be in DC is jetting all over the globe trying to sell helthcare and influence where the Olympics will be. I'm glad that the senator from Vermong could attend. I was a little worried that he'd miss it. Have a nice day! BONO is a chump. After all President Bush did for Africa and Aids research and helping Bono with this and Bono still talks ill of President Bush. Bono is a petty pathetic small little man.